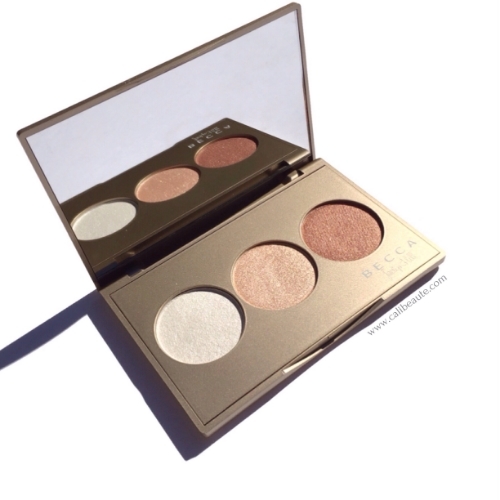 Another Jaclyn Hill X Becca Cosmetics collaboration recently released in stores and this one is a beauty. Jaclyn Hill’s exclusive Champagne Pop highlighter makes a reappearance in this stunning holiday palette which features three limited edition shades: Pearl, Champagne Pop, and Blushed Copper. Pearl is a brand new shade exclusive to the palette while Champagne Pop and Blushed Copper are shades that launched previously. The palette comes in sleek, gold rectangular packaging that includes a sizable mirror. 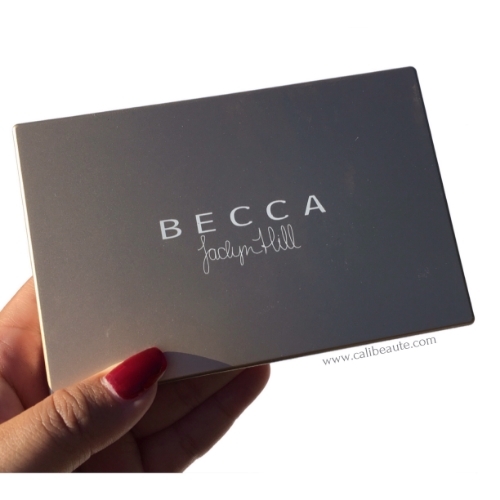 Jaclyn Hill’s signature is emblazoned right underneath the Becca Cosmetics logo on the front side of the palette, while the shade names are labeled on the back. It is sturdy, lightweight, and compact enough for travel. Pearl: Pale linen white. This beautiful shimmering skin perfector can also be used in the inner corner of the eyes or to highlight the brow bone. This white pearlescent shade swatched beautifully on my medium golden skintone. I would recommend using a light hand because all the colors pick up quite a bit of pigment. Champagne Pop: This peachy, luminous golden shade was created in collaboration with Jaclyn Hill. This shade in my opinion is probably the most universally flattering of the bunch. This shade is perfect for strobing because it’s not too light nor too dark. Blushed Copper: A combination of rose gold and copper with a hint of shimmer. It’s warm in hue, but quite delicate in color. This can probably work as blush if you’re fair toned. I’ve used this shade in combination with Champagne pop and it helps to soften the color a bit. 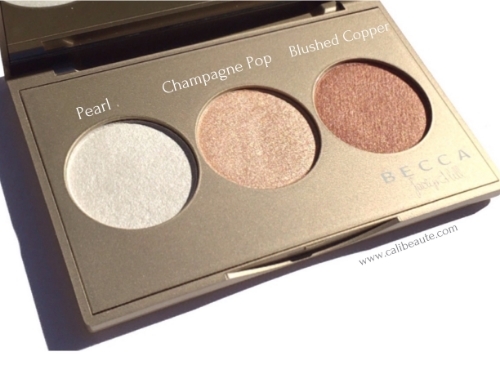 The texture feels the same as the regular Becca Shimmering Skin perfectors. They are extremely smooth and extremely pigmented. This curated trio is so versatile because you can create a unique, customizable color combination and it’s perfect on the go. It provides such a beautiful, luminous glow once applied. Again, I would recommend using a light hand because they are so pigmented. You can always build it to your desired intensity. 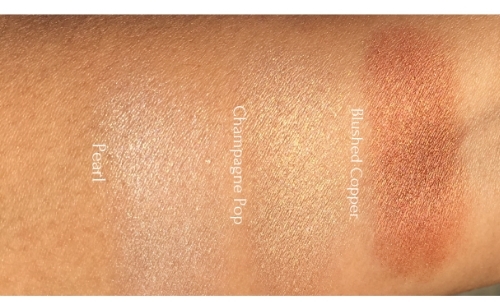 I was initially going to pass on this, since I have both Champagne Pop and Blushed Copper in their full sized versions, until I saw the palette in store. You can honestly use it in so many ways, whatever your skin tone might be. This coveted limited edition piece would make a great gift for any beauty junkie. I would also recommend this for someone who has not tried Becca Shimmering Skin Perfectors. It would be a great way to try a range of colors and it is such a great deal. I am happy with this purchase and look forward to using it in my makeup rotation. Thank you you for stopping by today!